Update, May 15: Private crews have been removed from Sea of Thieves, less than 12 hours after they were added. Rare quickly discovered that the new features were causing issues with the game, so were forced to pull the long-awaited update and take Sea of Thieves offline. While you’re waiting, why not instead have a go on one of the best multiplayer games on PC? The update (see original story, below) added three much-requested features: the option for open or closed crews, the ability to hand items to other players, and hiding gamertags when characters are underwater. Three hours after the update went live, Rare took the game offline and removed one of those features. From 14:45 BST the #SeaOfThieves servers will be offline for approximately 1 hour. Unfortunately the feature which enables players to hand other pirates resources is causing an issue and as such, needs to be temporarily removed from this patch while we investigate further. When the servers went back up,players began reporting crashing, the loss of progress, and ‘AllmondBeard’ errors. Rare took the game offline again, and when it returned the developers had removed all the new features including the option for private crews. Even without the update players have still been reporting problems, andthe team acknowledge that “the game is still experiencing server instability and players may experience issues”. As of writing, there is no news on when these issues will be fixed nor when the new features will be available again. The update was originally meant to launch last week, but Rare delayed it due to a bug that affected PC players. The laws of patching be a harsh mistress indeed. Update, May 15:Private crews arrr finally live in Sea of Thieves. Your patience has finally paid off, pirates, because you can now make your crews invite-only when you’re sailing the Sea of Thieves. After a brief delay due to a last-minute bug on PC, private crews are finally live. You can now choose between a closed and open crew when you log into the game. The new closed crew option lets you hop aboard either ship type solo, and will let friends join in whenever they’re available. Player counts max out at two for sloops and four for galleons. The new closed crew option will also replace the existing solo option, and a future patch will also let you completely block friends from joining you if you’re feeling that anti-social. An option to dynamically switch between open and closed crews while in-game is also coming soon. Open crews work pretty much as the game always has, with galleons filling up with four players and sloops filling up with two, matching you with new pirate pals whenever somebody leaves. This should hopefully cut down on most of the brig abuse pirates have been suffering of late. Today’s 800MB patch also includes the sneaking and cosmetics updates detailed in the last dev diary (see below), as well as some UI changes to make your interface navigation better. Update, May 10:You’ll be waiting another week for private crews, but there’s more to look forward to in this week’s Sea of Thieves update. Rare are settling into a regular stream of content updates for Sea of Thieves, and one of the biggest things we’ve been waiting for has been private crews. Sadly, we’re going to be waiting a bit longer for that, but a new developer update video has detailed what to expect from the next patch and the immediate future. A bug specifically affecting PC players was found during internal testing of the private crew update, which was scheduled to go live this week. Now, Rare say you should expect it to come next week. This week’s update instead features some corrections from last week’scosmetics addition. They’re responding to criticism of an overreliance on recolours by removing eight offending items, and the missing Sovereign set mentioned in last week’s patch notes will actually be there this time around. Additionally, some items were priced too high in the last update, so that’ll be fixed with overspending players getting the gold difference refunded through the customer service team. You’ll also be able to get stealthy when attacking other crews, as gamertags will now be hidden from enemy crews while you’re underwater, allowing you to sneakily board other ships. You’ll also be able to hand resources like cannonballs and bananas to fellow pirates, and high level quests will now drop far fewer low level Castaway chests. With these smaller updates in full swing, Rare still have three teams split among major upcoming content expansions. The first of these free updates is the Hungering Deep, which we’ll see a trailer for next week. Details are still light until then, but the update will have puzzle-solving and require cooperation between crews. Since this third of the dev team has had the shortest lead time in developing their update, it will be a bit smaller than the add-ons to come later in the year. Original story, May 2:Sea of Thieves is getting the much-requested option for private crews in its next patch, according to a new developer diary. Producer Joe Neate also talks a little about the upcoming expansions for the game. Currently Sea of Thieves only has the option for public crews, which means if a crew member leaves or is dropped for whatever reason they’re replaced by a random player, which usually results in the new player getting thrown in the brig until they leave and isn’t fun for anyone. The function to create private crews will allow players to avoid these kind of scenarios. The patch is planned for release on May 8. Neate also brought up the game’s upcoming major content updates, which they’ve talked about before. 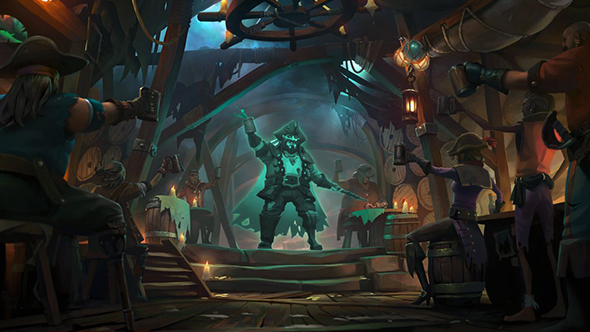 Rare has three separate teams working on these expansions – one is finishing off The Hungering Deep, which he describes as a “medium-sized content update”, while two others are working on the larger Forsaken Shores and Cursed Sails. Other welcome improvements coming soon include the ability to hand resources to other players, hiding a player’s name tag while underwater for a more stealthy approach, and additional customisation options. The game just added a round of new cosmetic items for characters, ships and weapons in the latest patch, but we always welcome more ways to dress up our pirates.